I picked out and transferred this disc for a couple of reasons. First, my good friends at Radio Discostan recently uploaded a podcast we did together, where I brought out some of my favorite performances by women singers on 78s – we called some of them “glass-shattering” for their remarkable vocal acrobatics. This record could easily have been added to that mix. Recorded ca. 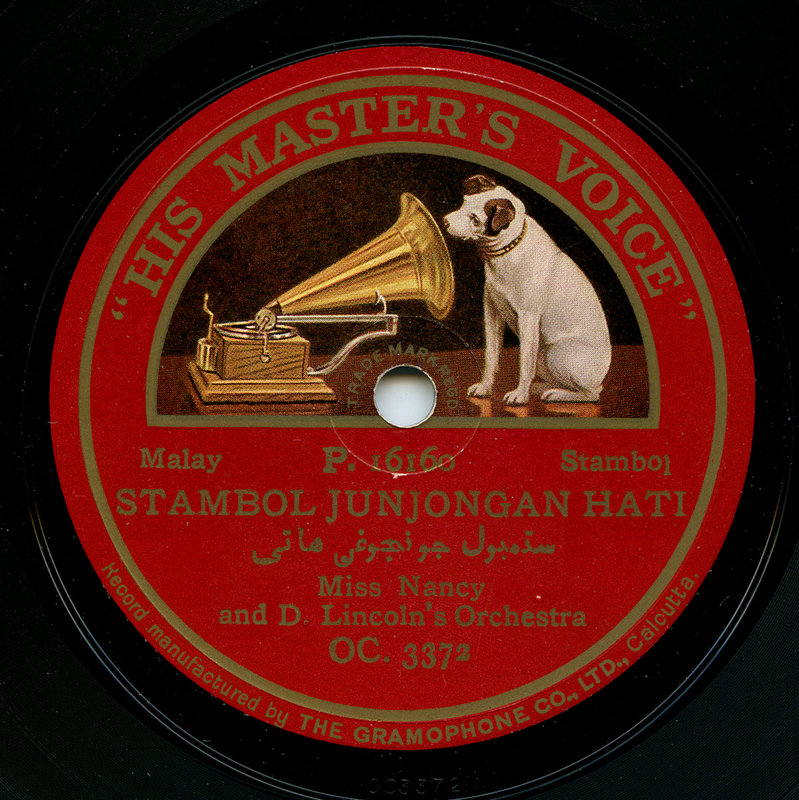 1936 in Singapore, it features the Malay singer known only as Miss Nancy, accompanied by a group that frequently backed singers of the day, David Lincoln’s Orchestra. Though, “orchestra” by present-day standards might be a misnomer. It features only violin, guitar, a ukelele or smaller guitar holding down the rhythm, and most importantly, a Hawaiian guitar, and is in effect more like a krontjong band. 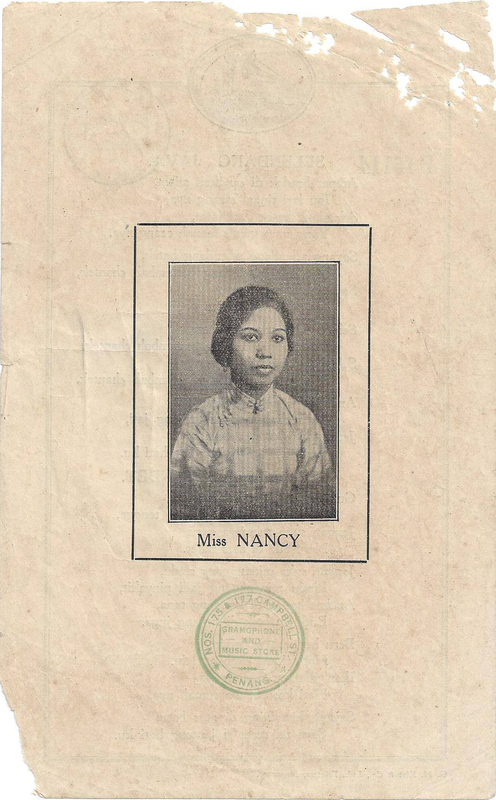 I’m afraid I was unable to find much about Nancy, as it was typical of Indonesia and Malaysian female entertainers to be referred to on record only by their first names, prefaced by either “Miss” or “Che” (though there is record of her making a number of discs). Here she performs a stambul song, or a song originating from Komedi Stambul, a rich type of theatre popular in the region from the late 19th century, with roots in Turkey (“stambul” being derived from “Istanbul”). Its title is something like “Adoring Heart” or even “Bless Your Heart.” Musically it is quite typical of the popular entertainment of the day, and Nancy appropriately takes her strident blare to welcome sonic heights. The second reason for picking this disc is a little different. This record came from the collection of Benno Häupl, who passed away in late April. Benno was a legend among collectors for his seemingly relentless peregrination, his tenacious collecting habits, his considerable knowledge of cultures and willingness to relate all manner of worldly escapades, as well as for his collection itself – surely the most diverse and perhaps the most significant private collection of global music on 78 rpm outside of the United States. Collectors talking about other collectors – to outsiders that must seem like inside baseball at best, and gossip at worst. But it got me ruminating about these relationships, and I started digging through old e-mails. I corresponded with Benno for only about 8 to 10 years, and therefore am in no position to write a remembrance with any real depth, as I solely knew him as a collector and even in that pigeonholed realm there are others who had known him for 30, 40, maybe even 50 years. We were not quite close enough to be “friends.” However, I have to say that his taste had certainly been a strong influence on mine, even if we hadn’t eventually connected. For one, he was well-known as a sometime contributor to numerous CDs including the Secret Museum of Mankind series, as well as various releases on Heritage/Interstate, and was a chief source for Paul Vernon’s Ethnic Music on Records reference book, the only book of its kind. We intersected almost immediately after I began to focus my interests. In the ensuing years, I’d heard Benno’s mythic stories of traveling to Lahore, Pakistan to purchase the remains of a Hindustani 78 store from the 30s, with the entire stock sitting in boxes in a basement, new and untouched, and how it took him years to pick up one copy of each record, regularly sending the owner of the shop insulin and medicine to ensure that it might still remain there until his next trip to the city. I’d heard about Benno’s trips to hunt for 78s in Port Dickson, Malaysia, Mali, Cappadocia, and Cambodia. He told me a bit about his trips to Yemen and Oman, the latter a place that he highly recommended I rent a car and drive through, even giving me route advice, and I heard the story of how he bought what was left of an entire 78 label’s stock in Kuwait. If it existed on 78 and was painfully rare and regional, likely Benno had not just one example, but perhaps 50, perhaps 100, perhaps, like his Indian records, thousands. Benno would occasionally sell large portions of his collection with an eye toward eventual dissemination, and several times he explained his plan and reasoning to me in detail. He told me he didn’t much care for African music, for example – he “only” had 500-600 of them – so he sold them off, one by one, rarity by rarity. This was entirely disingenuous, in a funny sort of way. Of course I knew he loved certain African music, such as the early music of Morocco, Ethiopia, and Madagascar, among others. Those discs weren’t going anywhere! What he clearly had admiration for stayed close to him. But even what he divested was frequently top shelf, and even one-of-a-kind. Over several years, he continued to sell his Caribbean collection, and a significant portion of his Indonesian and Malaysian discs. But, good lord, he was ferociously competitive, forcing the few who might deign interest in the same recordings on the market to reconsider if they came to light. With an eagle-eye, he left few stones unturned. If he prevailed on a particularly brutal auction where we were primary competitors, he would immediately send me a note apologizing, stating that, well, sorry, but his collection “had priorities.” Quite often I would manage to triumph, and again, I would receive a congratulatory e-mail from Benno, commending me for my erudite taste, but always letting me know that it didn’t really matter quite as much to him, as he luckily had some 43 examples of said rare musical style already safe in his collection. It’s disheartening to have an elder statesman of sorts treat you like an interloper, no matter if it was sugar-coated or not. But then again, that’s precisely what I was: the competition. It’s all in the game. My comparatively sedate collecting habits evolved precisely from and with the benefits of the internet age. For Benno, someone who had been traveling the world to hunt for records for decades, the rest of us neophytes, “erudite” or not, must have seemed like cheap carpetbaggers. Whether or not he truly felt that way, it never showed beyond playful jabs, and he readily admitted to me that he mainly collected via the internet. He remained a congenial bastion of arcane knowledge, always happy to divulge information and source material, especially if I was working on a project. That’s not to say that I didn’t sometimes find him contradictory, intermittently fanciful, and occasionally patrician to the point of total frustration. He had so many amazing, unfinished projects. He kept collecting like a runaway train – two weeks before he passed, he had bought a rare bagpipe 78 from me. But, in this world of 78 collectors, it would be peculiar if one weren’t an eccentric or complicated in some noticeable ways – and this was the only side of him I ever got to know. Today, I own a LOT of records that once were Benno’s, and nearly each one came with an ornamented story. I’m just one of many music fans out there with “Benno stories.” Very little has of yet been written about him. Some people call the great Joe Bussard “the king of record collectors.” It’s a fun if hyperbolic moniker – Mr Bussard is surely one of a kind, and what he’s preserved has rightly become legend. But if you want to talk about global scope, miles traveled, countries visited, regions recorded, and rarities rescued…if I’m forced to take that mantle seriously, you know where I’ll place my bet. So, no, I didn’t know Benno well. I don’t have a clue what moved him. But maybe he got me to think about the reasons for collecting 78s to begin with, and what was exciting about them, as well as the dark side. To the consternation of many collectors, Benno’s wish was that his collection go to an institution. I hope all the “Benno stories” go with it. I plan to go to the probably most remote area of the Sahara: the Ennedi Plateau and the Tibesti Mountains in the North of the Chad – for a month in February and March. I always wanted to see the pond at the Archei Canyon – “discovered” by Westerners only some 15 years ago – where there are 6 or 7 Nile crocodiles in the middle of the desert, surviving since the climate change after the Ice Age!!! A mystical place where camel caravans stop by to “have a drink”. From the last town it takes 5 days “through the void” by Landcruiser to get there. Special thanks to Alfred Ticoalu, and Will Hancock, for the photo of Miss Nancy. My earliest recording. This single-sided, 7″ record was made in Singapore by recording engineer Fred Gaisberg and his assistant George Dillnutt, on a lengthy trip through Asia for the Gramophone Company in 1902-1903, where thousands of recordings were made. Specifically, this was recorded in May, 1903. It was the very first time in history a recording company had visited and recorded in these regions. On the same trip, Gaisberg visited and recorded artists in Bangkok, Rangoon, and Japan. The wax masters were shipped to Gramophone’s plant in Hannover, Germany, where they were reproduced, then exported back to Asia. Gaisberg (1873-1951) is a giant in the history of recorded sound. Not only was he one of the very first “producers” of music on record, he also helped standardize the speed (78, or more precisely, 78.26) at which the music was to be played back. He made the first recordings by tenor Enrico Caruso, in 1902 – one year before he became the first engineer to produce records for emerging Asian markets. At this early stage in Malaysia, very few people could afford Gramophone discs, much less a player. Those who could afford them included British officers and business owners, those who worked for the British (called “Babas”) as well as local merchants and traders who were particularly well-off. That said, the presence of numerous record companies in the region by 1920 proves the market was widening substantially. As if it even needs to be said, however, comparatively few of these recordings have survived. If you are interested in the life of Fred Gaisberg, check out this book. 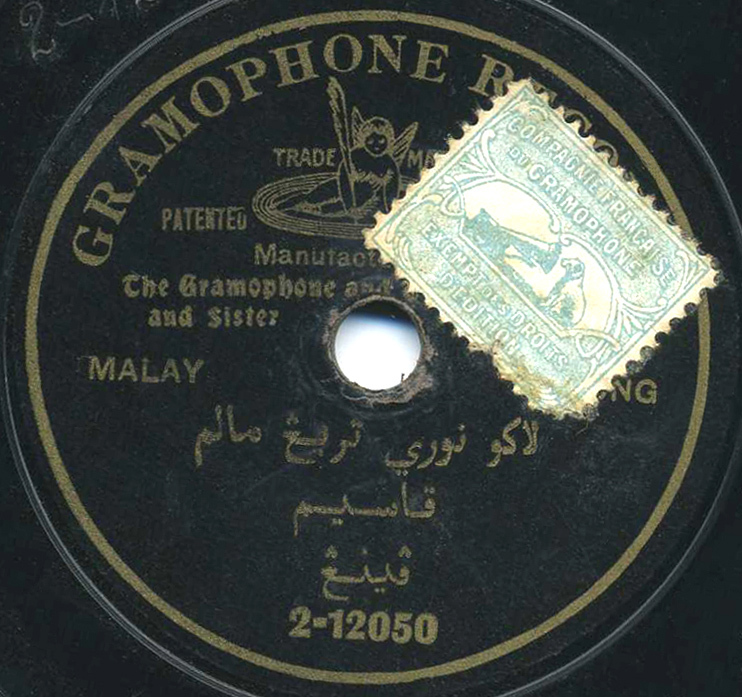 If you are interested in the history of recording in Malaysia, check out Tai Sooi Beng’s article “The 78 RPM Industry in Malaya Prior to World War II,” published in Asian Music, Fall/Winter 1996/1997.